Ok, there is definitely one thing I took away from last weekend's clinic: a very bad cold. There we go. When I entered the arena, I gave Hafl one of these warm ups (remember my article on the importance of the warm up: http://dressagehafl.blogspot.co.at/2013/11/the-importance-of-warm-up.html). You know, the ones where you try to concentrate but also want to see the trainer and the rider which is currently being coached. And to be honest, from Tuesday onwards, Hafl was out of order due to a small injury, I only rode him Thursday before the clinic. So I started with a long walk period and shortened the reins straight away for trot. A little canter and then there was our turn. We started with serpentines and the biggest issue we have is RHYTHM in these: every curve Hafl comes back a bit and on the straight line he gains tempo. That's bad! I knew it and it did not make the trainer happy (well, me neither), so he asked me to give half halts in the right moment. Further, he asked for continuous counting: ONE, TWO, ONE, TWO when riding through the curves. And it worked out!!! We rode the most beautiful serpentines ever! Hell yeah I could do it (forget about embarrassment and disappointment, YOU RULE GIRL). Well, at least until he asked for canter! That was even way beyond a disaster. What happened? I tried with all my might (and ALL my hands) to shorten his strides resulting in an ugly whatsoever 4-beat canter. Immediately, the trainer asked me to stop. He took the time to explain to me that as a judge (and he in fact is! ), would give a 3 for that canter. 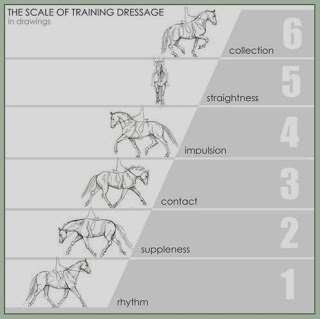 For him, what counts is quality of the gaits which means as long as there is rhythm, there is a mark. As soon as he sees 4-beat, for him the chance to get any marks is gone, no matter how good and precise I'd ride a test. What he asked for was a canter, a true canter, so I had to canter way "faster" than I used to the last few months. He said he was waiting for a good quality canter and afterwards we would start with collecting exercises like spiral in and small circles. For him, there is no way to force a horse to shorten its strides. Hafl needs way more strength in his haunches to start offering shorter strides himself. Everything else would only ruin the quality of the gaits. That made absolutely sense to me. The second problem we have (still!) in canter is that I have him very strong pulling on the reins. He even rests I guess half of his weight on my arms. The solution for that was to release the reins a bit, one or two strides, get them back (not throwing them away of course!) and send him the message: hey guy, you can carry your head yourself! After a few rounds (I was dying already because steady cantering for such a long time limits my ability to breath ;) ), Hafl realized what we wanted from him and started, instead of fighting and pulling, to let his neck fall down, being light in contact. Not yet round enough but better than before. That was day 1 and I was still like: OMG, whenever he was my jugde, he would not give me any marks - he must think: what an idiot. At night I had some time to chat with him and he re-assured me that I am not a bad rider (well, I guess after that lesson you have to tell me things like that) and that we should keep on working like we did that day. The second day I wanted to show that I was not the worst rider on this planet. So walk, trot on short reins, no canter (let's save some energy hm?!). Then it was my turn and he said straight away: why are you doing your wam up so completely wrong?! He watched the walk and trot I did with one eye. I halted in front of him and he started to explain that I cannot sit on a horse and expect suppleness and easiness in movements. So, after having heard about training scale foundation the day before, we started with step number two that day: SUPPLENESS! He asked me to trot on and start with serpentines (remember the RHYTHM) and get his nose down and out. It was really on a loser rein that I was used to (as I had problems with him getting to fast, I obviously shortened the reins to avoid that!) and kept on trotting, round after round, in the search of a lower neck, a nose down and out and a supply horse. After some rounds we change to work on the circle, leg yielding. STILL, down and out which proved out to be pretty tough. But I could see a change in him, his back started to swing, the contact got lighter. And there we were on step number 3 of the training scale: CONTACT. With that nice frame, canter work started and worked out way better than the way before. Ok, you cannot expect miracles but while spiraling in, I could feel my lower back rounding which showed me that he started to thoroughly use his haunches as sitting became easier and easier and the neck became rounder and softer. 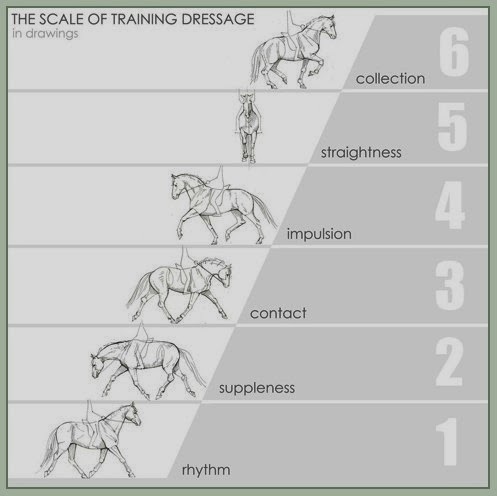 Right, that is step 4 of the training scale: IMPULSION. Developing the carrying, lifting and thrusting power of the haunches. How could you see that? Normally, as the circles get smaller, you can see Hafl change his strides, which is also a part of losing rhythm but you can also see that his haunches are not yet carrying. That makes these exercises so difficult for him, but on Saturday some parts of the smaller circles were already pretty ok - not good, but ok. So what we need to do is to keep on working on these moments in order to reach our final goal of collection! And it will take time and there IS NO SHORTCUT on that training scale. Every day you have to ask yourself if you and your horse are really ready for the next step and in case if not, go back and work on a lower step. Everything else will not work. Understood! After those tiny tiny highlights in canter, we did some sitting trot work and how can I describe it?! It felt like riding on a cloud: he was supple and light in contact and I did not have to do a lot to keep him in frame and rhythm. Everything felt completely easy and soft. That was the moment when the trainer said: "See, you don't have to do a lot to ride like this. Sometimes, less is more! Especially in dressage, where everybody tends to do too much!". Well, he was right but that was only true after a weekend where I paid a lot of attention to the basics as there are no shortcuts to this feeling you get as reward.